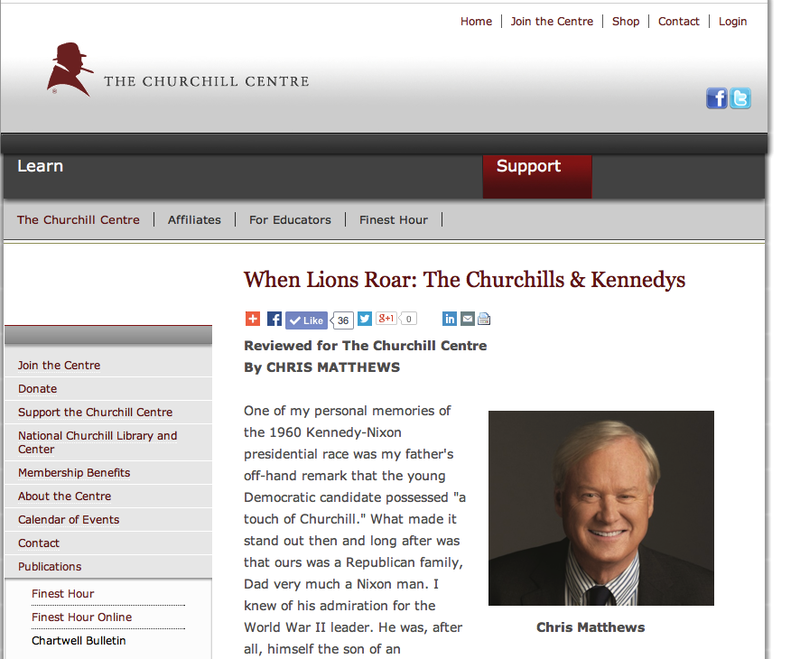 There's a terrific review of WHEN LIONS ROAR: The Churchills and the Kennedys" contained in The Churchill Centre's latest newsletter, The Chartwell Bulletin, which is written by television Hardball's Chris Matthews. 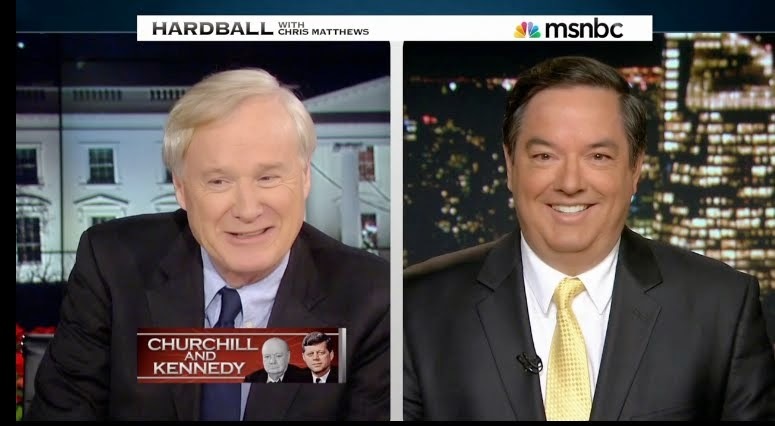 You can read it all here on their website and you can also take a peek at my interview with Chris Matthews on Hardball recently and Chris's televised editorial about Churchill and Kennedy citing my book. (Many thanks to Chris, an author and journalist I've long admired). Along with the review, the Churchill Centre also offered this interview with me about the new book. CB: Tom, welcome to Chartwell Bulletin. You began your career as a journalist; tell us how you made the transition to biography and about some of the subjects that first interested you. TM: All five of my books are about America in the 20th Century, even this one about the families of JFK and Winston Churchill, (who, in a sense, was half-American because his mother was born in Brooklyn). Many of the best biographies and histories of this generation have been written by those who began in the newsroom rather than the academy. Pulitzer-winner Robert Caro (author of biographies on LBJ and Robert Moses) began at my newspaper Newsday in New York and this year another former Newsday colleague Dan Fagin won the Pulitzer for General Non-Fiction. The skills of an investigative reporter are invaluable in coming up with new historic discoveries and writing a vivid, ground-breaking narrative. CB: You first wrote about the Kennedy family in your 2003 book, The Kennedy's: America's Emerald Kings. What led to you to them as a subject and what did you find of particular interest in this very well-documented American family. TM: So many Kennedy histories are caught up in "Camelot" imagery and ignore the impact of the family's Irish Catholic immigrant background on their personal and public lives. If you view JFK as the first US president from a minority background (his Catholicism was the top issue of the 1960 presidential campaign), then looking at his roots seems vital and proved ground-breaking for my first book about the Kennedys. The heart of this new book is the Kennedys' time in London leading up to World War II and how Winston Churchill had a lasting impact on President Kennedy and the US during the Cold War, becoming the successor to the British Empire in today's international arena. CB: How did you become interested in the Churchill family and in the Churchill/Kennedy relationship? What were your goals when you started your research and what sources did you find interesting and useful? TM: Both Winston and JFK were warriors, historians and superb statesmen who understood the power of words. Comparing and contrasting their remarkable dynasties provided great insight into the "special relationship" between America and Great Britain and was irresistible once I realized no one had ever written such a saga. It was a story hidden in plain sight, waiting to be told. Overall, my book contains 1783 separate footnotes, much of it from the Churchill archives, JFK and FDR presidential libraries, and collections at the Library of Congress and National Archives in London, where I read the fascinating papers of Lord Beaverbrook, one of many friends of both families. CB: What was the most revealing part of your research? Did you find things that surprised you? TM: Many of the biggest disclosures in When Lions Roar come from previously-unpublished documents, including those about the secretive 1933 British liquor deal involving Joe Kennedy, Churchill and FDR's oldest son, Jimmy. Documents about this business deal—and unknown letters from mutual friends such as Americans Bernard Baruch and Kay Halle—show that the Kennedys and Churchill were friendly before they became antagonists over America's entry into World War II, and ultimately how the younger generation became friends again during the 1960s Kennedy presidency era. This arc rewrites the conventional wisdom, in which some claimed the Churchills and Kennedys always disliked each other. This just wasn't so and the documents quoted in my book make their story much more complex and heart-rendering. CB: Given their legacies today, do you think the Churchills and the Kennedys defined and used "power" in similar or different ways? TM: Like a modern-day War and Peace, I wanted to write a big narrative history that captures the extraordinary lives of the Churchills and the Kennedys, with their ambitions, desires and legacy of greatness. Both Winston Churchill and JFK understood how great speeches, a sense of history, and intangibles like courage and wit were so important to their legacy. From a long view, When Lions Roar traces how power was transferred from the old British Empire to today's U.S. sphere of influence, and that JFK was perhaps the most effective heir to Churchill's legacy as a champion of freedom. CB: Why do you think Winston Churchill and Joseph Kennedy, as well as their sons Randolph and Joe Jr., had such opposing views on the rise of Nazi Germany in the 1930's? How did this affect their relationship, both professionally and personally? TM: War for the Churchills meant defending their beloved England—and all the liberties and human dignity that Hitler threatened—whereas war for the Kennedys, like most Americans during those isolationist times, meant only death and destruction in a faraway land and senseless loss of young lives. Eventually Joe lost his oldest namesake son and the war nearly killed Jack Kennedy too. It is so tragic to consider, especially given the many mutual friends these two families shared in the 1930s, how the evil of Hitler's Nazi empire tore them apart for many years. But how the young Kennedys and Churchill reconciled during the early 1960s and became close friends is one of the most surprising aspects of my book. CB:How would you compare the marriages of Winston and Clementine Churchill from Joseph and Rose Kennedy? How did these characteristics help or hinder the two men? TM: Both Winston and Clementine came from families with a lot of tumult yet their marriage maintained a rock-steady fidelity to each other and Winston's dream of becoming prime minister someday. Joe and Rose's marriage was upset by his infidelities, but they took great pride in their "family enterprise" with nine children. Joe Kennedy's failure as a politician, ironically, allowed him to pour his energies into his sons' public lives in a way that Winston never did with his son Randolph. CB: The Churchill and Kennedy sagas contain many interesting side characters who weave in and out of both their own and their family's lives. Were there some you found especially interesting? TM: The supporting cast of characters in this story who were friends with both families is truly extraordinary—from Lord Beaverbrook, FDR and Bernard Baruch to Aristotle Onassis, Evelyn Waugh and Pamela Churchill. 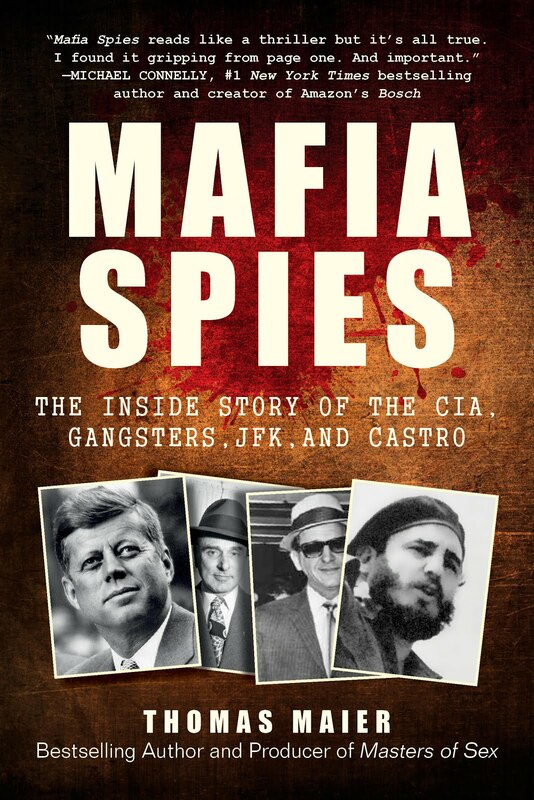 In particular, I'd like to think that my book gives serious consideration to independent-minded women such as Clare Boothe Luce, Kick Kennedy, Pulitzer winner Margaret Coit, Kay Halle and Pamela Churchill, who were too often dismissed in previous books about these two families. CB: Both Joe Kennedy as an individual and his record as Ambassador to the Court of St. James have been widely disparaged. Did Kennedy have strengths as an ambassador and what do you think ultimately lead to his failure in that position? TM: Joe Kennedy's desire for respectability in London was understandable, especially in the context of his Irish Catholic roots and his family's ambitions for higher office. But Joe's celebrated selection by FDR was done for a host of bad reasons, as my book explains. Joe's outspokenness was often wrong-headed, as his son Jack eventually realized. For more than ever before, this book closely examines the spy scandal at the US Embassy in London during World War II that would haunt the Kennedys for years to come. (One of the first things new Attorney General Robert Kennedy asked of FBI chieftain J. Edgar Hoover was the file on Tyler Kent, the convicted spy from his father's tenure). CB: From having examined the lives of both families in detail, would you agree that being the child of a great or famous man is both an advantage as well as a burden? How to you think this affected and was reflected in the lives of the children in both families? TM: Yes, the dynamic between fathers and sons—both the burdens and the advantages—is a big theme in this book. Both Joe Kennedy Jr. and Randolph Churchill were particularly impacted by their famous fathers and the expectations surrounding them. In a sense, Jack Kennedy, like Winston Churchill, benefitted from lowered parental expectations when they were young, allowing them to find their own voices. My book begins in 1930 when both Winston and Jack were at low moments in their lives and I hope readers enjoy learning how they achieved their respective greatness. CB: Now that we are approaching the 50th anniversary of Churchill's death, what would Joe Kennedy think about his iconic status today?